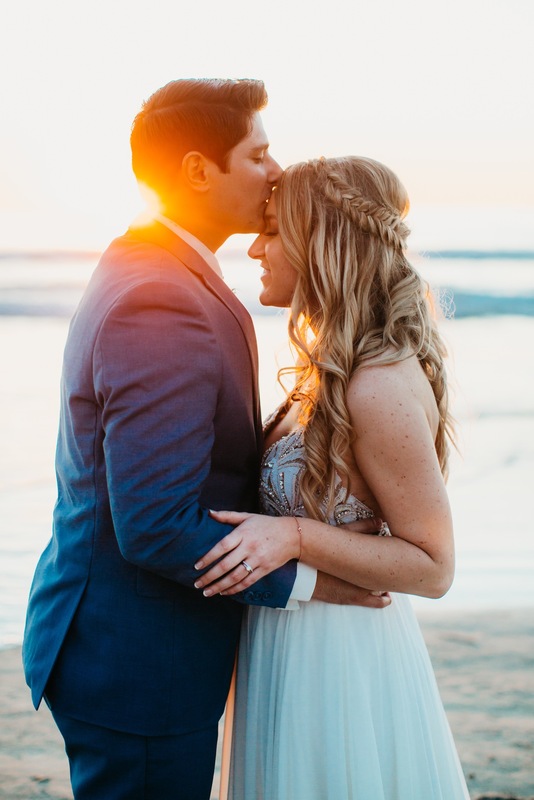 What’s cuter than high school sweethearts getting married with the sound of waves crashing in the background? Oh that’s right… nothing. Meet Chelsea and Thomas - the physical representation of the quote “It was always you”. So much so that those exact words marked the start of the aisle with floral draped, hand-painted signs. This duo suspected they’d be together forever in HIGH SCHOOL. Twelve years, college, grad school and one freakishly-adorable dog later (picture so much white fluff and rocking that wedding like it was his SuperBowl), they said “I do” on a day that felt like it was carved into the calendar just for them. It was one of those perfect San Diego spring days where the tide is low, the temperature was warm yet breezy, and the sunset was busy taking breaths away. Chelsea and Thomas fit right in. Their interactions with one another are so comfortable, warm, and STEADY. Chelsea stunned in her dress that San Diego sun in an ‘OMG’ way. No, but really. I literally gasped when I saw it hanging upon my arrival and rushed to Chelsea’s side to scream, “OMG YOUR FREAKIN’ DRESS!” Thomas kept us all laughing, even during their tender first look when Chelsea exclaimed “You’re already crying!” THE cutest. All tears aside though, he’s a straight powerhouse on the dance floor, and I want him hyping at every wedding’s dance party from here on out THANX. These two, you guys, they’re just gold. Cheers to YOU TWO!